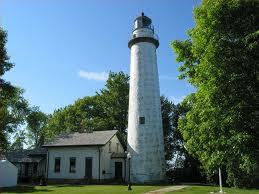 The Pointe aux Barques Lighthouse is in the top ten of oldest lighthouses in the state of Michigan. The lighthouse continues to be in active service. It has been remotely controlled by the United States Coast Guard since 2003. In French, “Pointe aux Barques” translates as “Point of Small Boats”. This refers to the very shallow depth of the waters at this point, where only small boats could safely navigate. The tower was originally planned to be built right at Pointe Aux Barques, at the extreme northwest tip of the Thumb. James K. Polk, U.S. president, allocated $5,000 for the construction on July 3, 1847. This was completed nearly 4.5 miles east/southeast of the actual Pointe Aux Barques. Due to problems in design and materials, the tower was rebuilt ten years later, in 1857. This structure, a cylindrical brick tower, painted white and 89′ tall, has lasted, in use, for 157 years now. It is connected by an enclosed corridor to a two-level house. This dwelling was used by the lighthouse keeper and family prior to automation of the beacon. Before electricity was provided to the lighthouse in 1932, the light was provided by a rotating Fresnel lens. This flashed every two minutes, the light being seen for up to 16 miles offshore. With the coming of electric power, an incandescent bulb was installed in the tower. The light bulb had a output of 120,000 candlepower. In 1939, the U.S. Coast Guard took control of all lighthouses in America. In 1950, the original Fresnel lens was replaced with rotating DCB-224 aero beacons. These devices provide one million candlepower. In June, 2003, after the lighthouse was automated and thus controlled remotely, no keeper was needed. The keeper’s house and the land around the tower were made part of the Huron County Park system. The light station itself is a functioning, active aid to navigation and as such is not open to the general public. The Lighthouse Park campground has been in operation since then, on the site of a United States Life Saving Service station that had been established in 1976. The 1857 tower has been registered with the National Register of Historic Places since 1972. There are two museums in the the park, called “The Keepers of the Light Museum” and “The Thumb Underwater Preserve”. The Fresnel lens from the original beacon is on display in the Huron City Museum. Since 2002, the Pointe aux Barques Lighthouse Society (PaBLS), has worked to restore and preserve the light station and museums. The lighthouse is beautiful and the campgrounds are by far the prettiest place to wake up to in Michigan! I LOVE camping there!